The famous mobile games company, Rovio Mobile Ltd has officially announced its new highly anticipated game – Angry Birds Rio, which has been upgraded with far more things to collect and added parallax scrolling to give the game quite a bit more visual depth than predecessor. Angry Birds Rio comes with newly storyline that original Angry Birds are kidnapped and taken to the magical city of Rio de Janeiro, Brazil. The new Angry Birds Rio also features two episodes, 60 levels, new achievements, special hidden fruits, and two news main character birds of Rio – Blu and Jewel. Besides that, Angry Birds Rio remains to be a finger-powered slingshot game with launch the attack with the foul-tempered fliers across levels packed with objects. Concrete blocks, wooden crates, bird cages, metal chains, and even foliage are meant to be busted and broken with a slide of a finger. Let the feathered artillery fly! Rescue rare birds from smugglers, then make your escape through the jungle. Recruit a whole flock of unique birds to join the cause, including Blu and Jewel from the movie Rio. Play through 60 Rio-themed levels in two fantastic episodes with a mixture of strategy, skill, and brute force. Find hidden secrets, win trophies, and earn coveted 3-star ratings on each level. More birds and levels are on the way! Expect more characters with unique abilities and more content from Rio. The new Angry Birds Rio is available for Android, iOS and Mac OS X platform. For a limited time, the full version of Angry Birds Rio is available for free in the Amazon Appstore, with no ads, while the ad-supported version has always been free on Android platform. In the iTunes App Store, Angry Birds Rio for iPhone and iPod touch costs $0.99 for purchase, while iPad HD option costs $2.99. For Android users who are taking advantage of free Angry Birds Rio game offer, Amazon Appstore app has to be installed for the app to be downloaded and installed onto the phone. 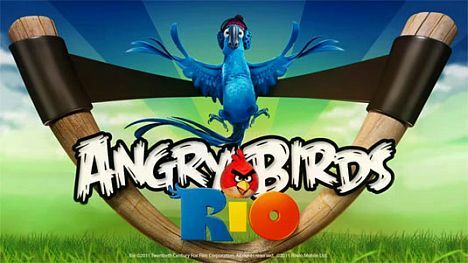 Note: The promotion of Angry Birds Rio full version with no ads free download is for US only.